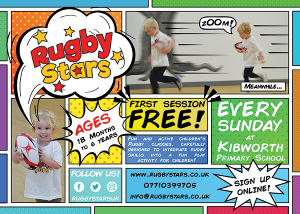 It’s been a wild and wonderful month at Rugby Stars! We reached our 2-month anniversary with record numbers and we’d like to thank all the parents, new and old for their support during this time! We started the month with some fresh new training tops for the coaches, replicas are now available in our online shop in sizes for ages 3 to 6 if any child would like their very own official Rugby Stars training top! On 10th March we celebrated World Book Day with fantastic book-themed classes for all age groups. We went on a bear hunt, saw a very hungry caterpillar and our juniors showed off their knowledge of some classic Julia Donaldson books, all whilst mixing Rugby skills, tag and SAQ training along the way. The theme gave us some major inspiration for future themed classes, so you really don’t want to miss out! We continue to work tirelessly to improve each class, spending hours each week refining plans and learning what works for each child. We have developed an amazing curriculum of plans that change week to week to ensure no class is like the last. We continue our work with SAQ (speed, agility, quickness) training to ensure your child is getting active, whilst giving them experience with rugby skills and having fun with some great games. We are so proud to see how much each child’s rugby skills have improved week on week, many of our children had never picked up a rugby ball before, and they are now throwing and catching with parents with confidence! Off the pitch we have been busy with local nurseries and pre-schools and have met some of the nicest people along the way. The work these people do with children day-in, day-out is so admirable and it has been a pleasure handing flyers and posters out. If any parents or readers are able to hand out flyers to your local nursery or pre-school, please get in contact for a bunch of our fantastic flyers to hand out! – Remember, our referral scheme pays you back for every parent you refer! This past Sunday we saw a number of children complete level 1 and move onto level 2! We couldn’t be more proud to see their hard work pay off and there will be many more to move up in the coming weeks. We hope all children enjoyed receiving their certificates! 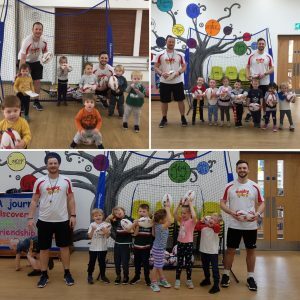 March saw us launch Rugby Stars PARTIES Where we offer our fantastic class formula and a lot more into a great party package for children. 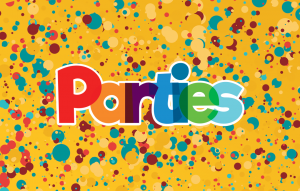 We are so proud to be able to offer all this for a very affordable price – check out our parties page for more info! As always, from all of us at Rugby Stars, thanks and see you at class!